Professional Gardening Services in Kensington and Chelsea. Your lawn looks uneven and has some bare and yellowing spots? Contact Thomsons Cleaning company which offers professional gardening services in Kensington and Chelsea SW to help you. We take pride in the high quality and reliability of our gardening services provided to residential and commercial clients in the area. All of our gardeners are vetted experts, who will take proper care of any type of garden or outdoor area problem you may have at a reasonable price. We can offer you expert: landscaping, tree surgery, lawn mowing and care, garden clearance, weeding, tree and bush pruning, ivy removal, garden rubbish removal and overall care and maintenance for your outdoor area. No advance payments. Reasonable, fixed prices. To get a free quote, call 020 3746 0000 or send us an online request right away. We are available 24 hours to answer your questions and requests. Our Kensington and Chelsea SW gardeners will make sure that your lawn looks excellent. They will repair any yellow or damaged areas, mow the lawn with a professional petrol lawnmower, feed the lawn, top dressing or do aeration and scarification. The full lawn maintenance is offered at a affordable price. We also can provide you with special autumn and spring lawn maintenance services too. If your garden is neglected, or you don’t have the time to clean it out from overgrown grass, trees and brushes, this service will be excellent for you. We will trim the overgrown plants and grass, and will them collect all the garden garbage and dispose of it accordingly. Up to 180l of garden junk will be disposed and removed of totally free - it is included in the gardening price. If you want to be sure that everybody is impressed by your garden - choose Thomsons Cleaning services in Kensington and Chelsea SW now! Thomsons Cleaning is recognized in Kensington and Chelsea SW for providing high quality, reliable cleaning and maintenance services among the private and business customers residing in the area. 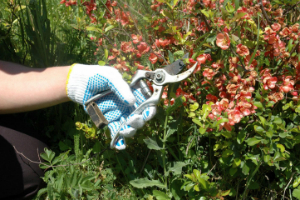 We offer a fully insured, efficient and safe gardening service to all interested residents of the area. It is suitable for landlords, property owners, homeowners and tenants in Kensington and Chelsea SW.
We can bring more beauty, air and light to your garden or other outdoor space in Kensington and Chelsea SW with our garden maintenance service. When you book this service, we will send two professional experienced gardeners to your address to perform an inspection and to discuss your intentions. They will give you their professional advice as well as an estimate of the hours which will be needed for completing the tasks you need and want. If you agree to them, they will start work by using the most efficient, latest and safest tools, solutions and gardening equipment. The garden maintenance service includes: trimming overgrown trees and bushes, weeding, removal of unwanted plants, gathering of fallen leaves, removal of ivy, twigs and other garden rubbish and rubbish removal. Up to 180l of garden waste will be removed by us and properly disposed totally free. To book our expert gardening services, or to request a viewing in Kensington and Chelsea SW for a price estimate, call 020 3746 0000 or send us a request here. The operators from the customer care center are obtainable 24/7. You will receive a written confirmation for the scheduling pretty soon. At this point, you are not needed to give us a deposit for the booking. Gardening is an hourly based service, but the gardeners will be able to give you their hour estimation only after they come and see the size and condition of the garden, and discuss the gardening plans with you. We are available for emergency booking. We are also available 365 days a year, so go ahead and book our expert gardening service for whichever day in the year you want!